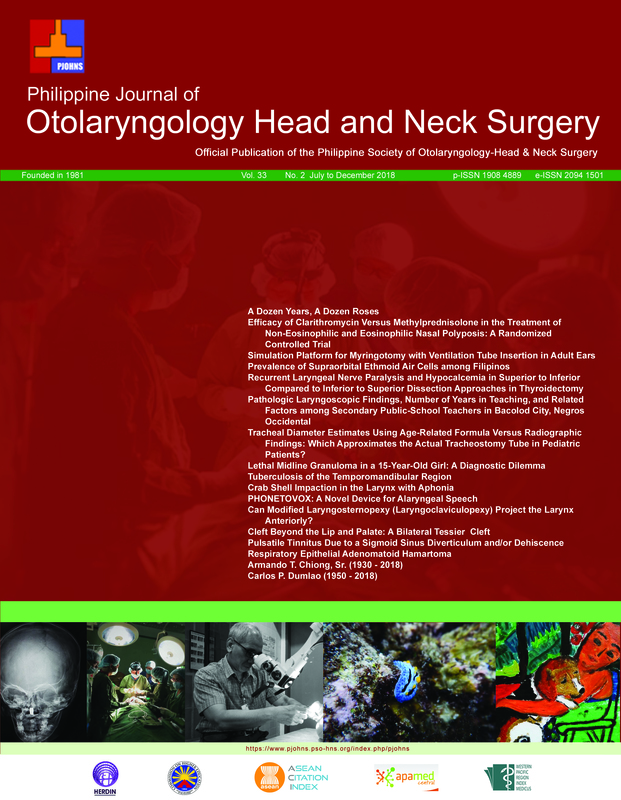 Objective: To compare the incidence of recurrent laryngeal nerve injury and hypocalcemia in patients who underwent thyroidectomy using a superior-inferior versus an inferior to superior approach in identifying the recurrent laryngeal nerve in a tertiary government hospital between January 2012 to December 2016. Patients: Records of two hundred forty-one (241) adult patients who underwent surgery for thyroid diseases in the department of Otorhinolaryngology – Head and Neck Surgery between January 2012 and December 2016 were evaluated. Records of patients with postoperative hoarseness after total thyroidectomy or lobectomy with isthmusectomy and hypocalcemia after total thyroidectomy were reviewed, and operative techniques analyzed for the approaches to recurrent laryngeal nerve identification. Results: Records of 119 patients (aged 20-73; median 41-years-old) meeting inclusion and exclusion criteria were analyzed. Of 57 thyroidectomies using a superior-inferior approach, 42 were bilateral, totaling 99; of 62 using an inferior-superior approach, 40 were bilateral, totaling 102. There was a higher incidence of post-operative complications among those who underwent inferior-superior dissection than those who underwent superior-inferior dissection. Chi square test showed the former approach (versus the latter) had 4.86 times the relative risk (RR) of permanent RLN injury (1.9%, 0.0475 to 5.5914, p=.3058), 1.62 times the RR of transient RLN injury (5%, 0.3971 to 6.5889, p=.5021), 1.92 times the RR of permanent hypocalcemia (1.9%, 0.0.1806 to 21.2838, p=.5910), and 2.06 times the RR of transient hypocalcemia (17%, 0.9055 to 4.4333, P=.0738). However, there was no significant difference between the two approaches with regard to hoarseness (independent t test, t value 0.90; p = .367) or hypocalcemia (t=0.428; p= .796). Conclusion: There is no significant difference in the incidence of recurrent laryngeal nerve injury and hypocalcemia in patients who underwent thyroidectomy using a superior-inferior versus an inferior to superior approach in identifying the recurrent laryngeal nerve. Intraoperatively, surgeons may shift from one approach to the other as needed, and we recommend that they be well versed in both approaches and fully knowledgeable of the various anatomical courses of the recurrent laryngeal nerve and locations of parathyroid gland.